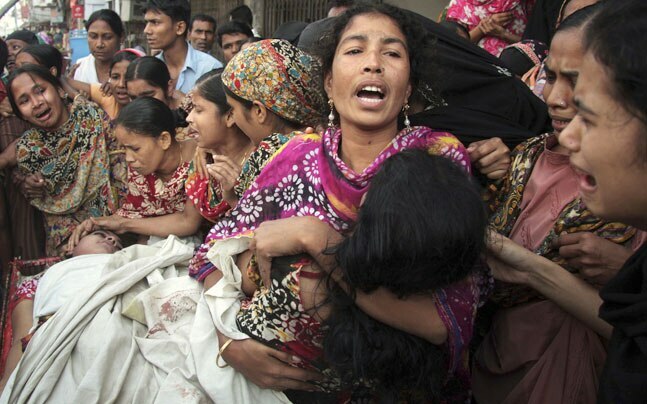 In this 2011 file photo, women mourn over their relative who died in a stampede triggered by a fire scare at a garment factory in Dhaka. In the past two weeks, “stampedes” took the lives of at least 33 people, 31 women and two children, in South Africa and Bangladesh. Yet again, the death toll among adults was exclusively, 100% women, and yet again the world will look on the pile of women’s corpses in shock and amazement, as we did in September 2009, when women were killed in stampedes in Indonesia, India, Pakistan and South Africa; or in January 2012 when women were killed in stampedes in Pakistan and South Africa. Each time, despite the gender of the dead and of the event, the fact of this being an assault on women is erased. Today, in the northern Bangladeshi city, Mymensingh, hundreds of “poor and emaciated” women gathered outside a garment factory owner’s home to pick up free clothing. Someone fell, others fell, and then the rush ensued. Thus far, 25 bodies have been recovered, 23 women, two children. Fifty women have been sent to hospital. A scan of the world’s headlines on this event shows one headline that acknowledges this salient gender feature: “Bangladesh stampede leaves 22 women and child dead”. The rest either cite a number – “Stampede at Bangladesh clothes handout kills 23” – or refer to the clothes giveaway – “23 Zakat cloth seekers killed in Mymensingh stampede” – or mention people – “25 People Killed in Bangladesh Stampede”. Only one, that I’ve found, acknowledges the women. Why? What is so terrifying about saying 23, or however many, women were killed? In Khayelitsha, in South Africa, two weeks ago, a gunshot at Osi’s Tavern provoked a rush from the tavern. It was 3 in the morning, and the tavern was crowded. It had only one exit, one staircase. The staircase collapsed. Six women were killed on the spot. Two women were killed on their to hospital. The women’s ages ranged from 15 and 23. In some ways, two seemingly different events end up with the same morbid mathematics of gender: women were killed. There was no stampede in Mymensingh today, and there was no stampede in Khayelitsha last month. There was a massacre of women. Say it. Women were killed. Now the State steps in, once the women’s corpses have piled up sufficiently, and claims to act, but it will never acknowledge the simple truth. There was no accident. There was indiscriminate and brutal slaughter of women, a massacre, and it was always part of the plan. Why Are We Not Enraged By The Fire In A Sweatshop In Bangladesh? Why is it when women jumped to their deaths to escape the deadly fire in the Triangle Shirtwaist Factory in New York City in 1913, we are even today able to be horrified at the management’s cold blooded view of workers as expendable? But why is it we are not as enraged when hundreds of women were killed in the April 2013 Rana Plaza Factory fire in Bangladesh? Even when we know that the workers were making products for Disney and Walmart, why aren’t we horrified? Shouldn’t we be enraged that workers anywhere are killed because of lack of safety standards, regardless of which company they are working for, whether it is a multinational company or a local company? Once we put an American face on the sweatshop, one hopes that will generate some amount of questioning, such as why Walmart has not followed safety standards in Bangladesh, what companies are overlooking safety regulations, why they are exempt from local laws regarding worker safety, and so on. More importantly, when we see advertisements showing how most of us profit from shopping in Walmart because of their low prices, shouldn’t we be asking how we are implicated in Walmart’s ability to keep prices low? Who benefits? At whose expense are we enjoying bargains? But, perhaps, we are so conditioned by the system of consumption, where the ideal customer is often confused with the ideal citizen, that we do not see the shadows of workers behind the aisles of clothing or behind the glass cases holding our electronic gadgets. The worker has become as intangible to us as a theorem or a cosmic body. How can we see/feel/touch/hear/smell workers in the business of making our life livable? Once the American consumer is able to SEE the connection between his/her “deals” and “specials” and the masses of brown, malnourished women working in unsafe factories making the goods that flood markets in the U.S., the consumer will become informed and this would be the beginning of addressing the rights of both the worker and the consumer. But this connection cannot be established if the consumer is not really given the full “news” about the conditions of workers. Just as we know so little about the wars in Iraq and Afghanistan, we do not have complete knowledge about sweatshop atrocities. 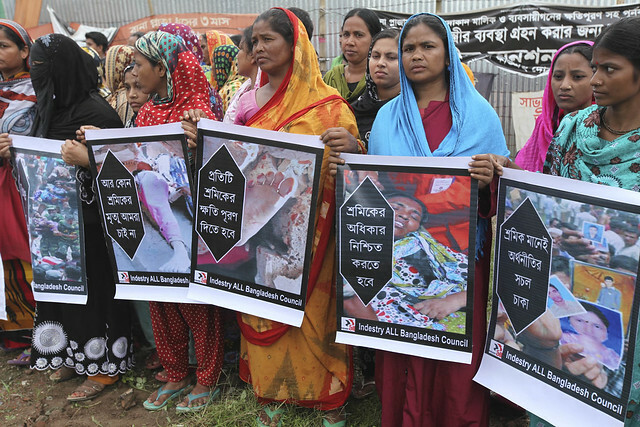 The news media has not shared with the American public images of sweatshop workers dying and injured in the Bangladesh factory fire. As Amy Goodman says in an interview about the American wars in Iraq and Afghanistan, if Americans were to see graphic pictures of war, they will urge their government toward other means of resolving conflict. Images of workers’ in unsafe conditions will have the necessary effect on consumers, which will then propel companies to act and governments to enforce laws protecting workers. It is a shame that the U.S. multinational companies can shelter under the very laws that are meant to protect workers. Elizabeth Cline points out, “In 2009, the Ninth US Circuit of Appeals ruled that workers in foreign factories that supply Walmart can’t hold the company responsible for their workplace conditions, despite the retailer’s code of conduct that’s supposed to hold its contractors to decent labor standards. This lack of liability is enjoyed by every retailer that uses contracted factories, which they do not own. It’s this loophole, the one that legally distances clothing companies from the very people who actually make the clothing, that has consistently and historically wrought disaster and human tragedy. This chilling othering of the worker makes us lose our very humanity. We can create a movement by posting images of atrocities as a way of mobilizing the public to stand up against a greedy capitalism that is eroding both worker rights and our rights as citizens. It is time to say, we are global citizens, not consumers. It is time to claim our humanity. Cambodia is not Bangladesh, and Asia is not a country! A week ago, thousands of mostly women garment workers in Cambodia blocked a national highway for a half hour. This week, about 3000 mostly women garment workers at the same factory, a factory that produces clothes for Nike, again sat down in protest. This time they were met with stun batons. Over 20 women were hurt, and so the international press showed up. Cambodia is not Bangladesh, and Asia is not a country. There were no real surprises in the new world order. Competition among exporting countries drove prices down. Those who were prepared for the change, such as China and Cambodia, saw their national fortunes improve. That doesn’t mean the lot or lives of workers improved, but the national economies grew. Everyone involved knew that the super majority of garment workers are women. Every study and every theoretical model stated that both in the short term and in the long term putting garment production under the WTO and GATT would be bad for women workers. But the national economies, and the free market, had to grow. The women workers would just have to deal with the price they must pay for everyone else’s success and justice. So, this sounds like Bangladesh, but it’s not. Between 1999 and 2004, the United States and Cambodia had a deal. If Cambodia demonstrated improved factory working conditions, it could send more to the US markets. Cambodia sends almost all of its exports to the US and Europe, and so this was a big deal. The ILO monitored the conditions through something called Better Factories Cambodia, or BFC. BFC increased individual factories’ US export quotas. It also engaged in capacity building with State, labor and management stakeholders. Cambodia established an Arbitration Council to deal with labor disputes. Many workers’ health and safety conditions improved. 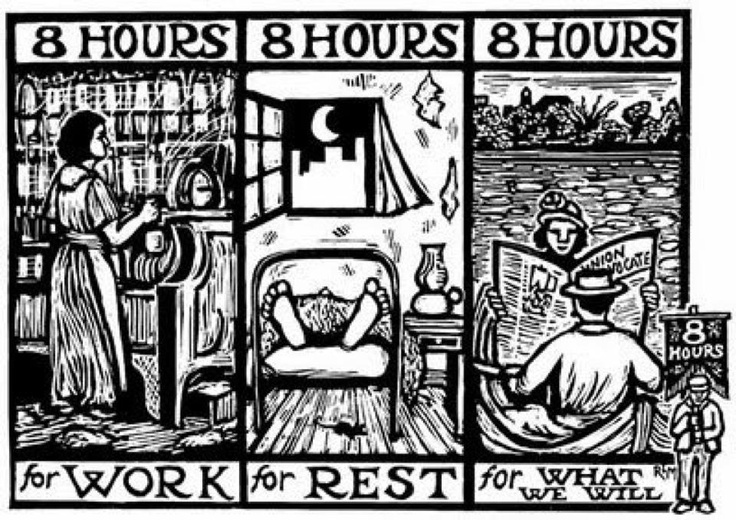 Of course problems remained, such as involuntary overtime and lack of childcare facilities, but a growing labor movement addressed them. 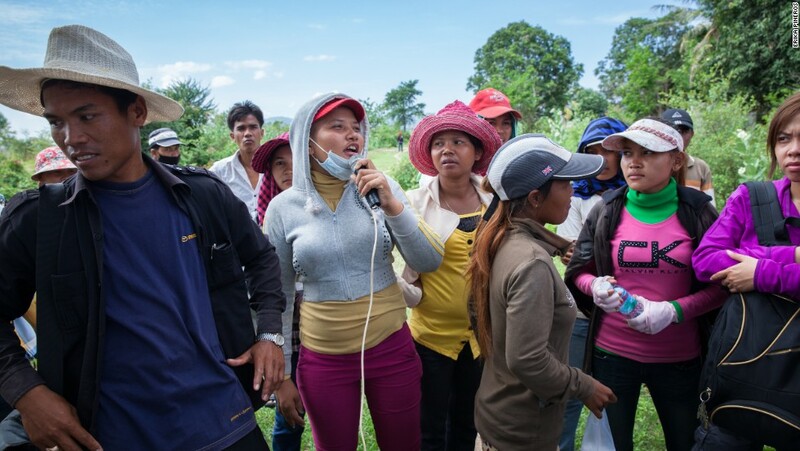 Along with two decades of industrial garment industry hyper-expansion, Cambodia witnessed the emergence of hundreds of unions, of thousands of organized and wildcat actions, of an increasingly entitled and powerful women workers’ movement. Women garment workers in Cambodia and in Bangladesh pay a heavy price for the global garment industry. But then … women workers everywhere pay a heavy price for economic growth as for economic decline. For that reason, it’s important to locate the story of the Cambodian women workers more accurately. They are industrial women workers, and they are struggling for exactly the same things that industrial women workers in the Europe and in the United States are struggling for: better pay, better working conditions, dignity, respect, autonomy, power. A month ago, Better Factories Cambodia released its annual report. The number one issue is fire safety. In the past year there has been “a large drop in compliance.” On the factory floor, the owners are cutting corners and endangering women workers’ health, well-being, and lives. In the national context, the owners are cutting women’s salaries, “because of the economic downturn”, and are widening the wage gap between women and men. Just like in the United States. What is to done with the grief of States expressed each time border troops kill or maim someone? What is the worth of their repeated assurances? Where is the future in which border guards will not shoot at children caught on barbed wire? And what is the name of the space that separates the dead body of 15 year old Felani, about whom the State is silent, and `the incident’ over which the State expresses its grief? Apparently Felani and her father left their home in Bangladesh ten years ago and crossed into India. They were on their way home because a marriage to a local boy had been settled. Felani’s father successfully scaled the border fence. Felani got tangled up in the barbed wire and started to scream. The Indian Border Security Forces heard the screams, saw the girl, came, shot her and waited for her to die. Some say she bled and screamed for four hours, others say for less time. Whatever the duration, Felani, a fifteen- year-old girl, hanging upside down from the border fence, riddled with bullets, bleeding and screaming, died. The BSF then waited and finally cut her down and carried her away, hands and feet bound to a pole, like so much animal carcass. A day or so later, they arranged the meeting where they returned the body and expressed grief … over the incident. Bangladeshis, and Indians, have expressed outrage at the incident and shock and disgust at the photographs. But who expresses grief at the border fence? According to a Human Rights Watch report issued just last month, the Border Security Forces at that particular border are `trigger happy’. Children, such as 12-year-old Rumi Akhter Nipa, are routinely, randomly and indiscriminately shot. What do girls, like Rumi, want? According to Dr. Abdus Samad who treated her, she simply wants a daily life, to start school. What do children, like Rumi Akhter Nipa, get? “A pattern of grave abuses”. And, as Felani’s story suggests, they are to be considered the lucky ones. The borderland is a graveyard. As long as the State, any State, is ruled by security first, as long as the borders are considered primary and the crossers, with or without documents, are secondary, the borderland will remain a graveyard. That is the reason that “despite numerous complaints no member of the BSF has been arrested, much less held to account in civilian courts.” Hundreds of Bangladeshis and of Indians have been killed and not a single member of the BSF has been arrested. Felani is not alone. Grief emerges from graves, not from incidents. Apologies cover incidents, shrouds cover the bodies of the dead. The State of India expresses its grief? And Felani is dead.